Still outside, Zoe gets cornered by a particularly beefy zombie. As luck would have it, the chainsaw dies. Zoe is about to become zombie food, when out of nowhere she casts some kind of spell that stops the zombies and drops Marie Laveau to the floor. While all of this chaos is happening, Fiona is at the hospital waiting for word on Cordelia. Fiona is taking more pills, and a doctor comes out to tell her that Cordelia has been blinded by a sulfuric acid attack. Fiona is wandering the hallways, and finds the medication room. She breaks in and steals a bunch of drugs. She sees the woman in black who attacked her daughter, but a man distracts Fiona by telling her she didn’t throw the acid, but she may as well have. Fiona ends up in the nursery, and in the room of a woman who’s baby was stillborn. For some reason the baby is in the room with the mother. And the hospital looks pretty crappy. Maybe it’s Fiona’s interpretation of it in her drug-induced stupor. Either way, she hands this stillborn baby to its mother, and makes the mother promise to love the baby until it dies. Fiona touches the baby, and it comes back to life. Maybe she’s not too bad after all. Cordelia’s husband shows up at the hospital and Fiona berates him for “finally” showing up. Fiona does not like him, and spins the whole situation to make it seem like Hank is only pretending to care about Cordelia. Fiona tells him he has 15 minutes with her, and then he has to leave, preferably for good. Hank takes Cordelia’s hand, and somehow, even though blind, she sees the vision of Hank sleeping with the girl in the hotel. Fiona, Nan, and Zoe are burning the dead zombies. Fiona tells Nan that Luke will stay with them until he is healed. Nan is thrilled and runs inside. 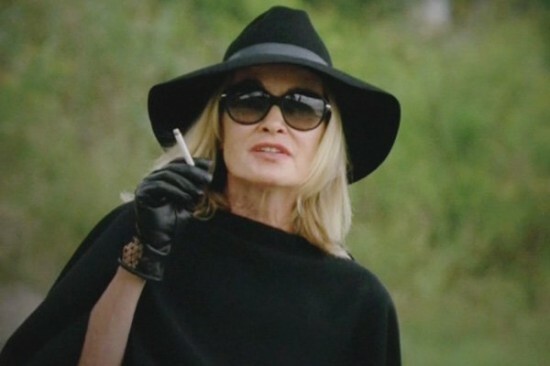 Fiona tells Zoe that she is a fighter, and that she has done a great service to the coven. The Council shows up, and tells Fiona that she has been voted out of the coven, and will no longer be the Supreme. The Council will run the Coven until a new Supreme is found. Fiona is outraged, and blames everything on Myrtle. Myrtle has been in town for weeks, unbeknownst to the other members of the Council. This simple fact is enough to let Fiona convince them that Myrtle must have killed Madison. She pulls Myrtle’s glove off to find a burn mark on Myrtle’s hand from the acid she threw in Cordelia’s face. The other Council member vote to burn the witch. Myrtle declares that she will go proudly to the flame. Myrtle is burned at the stake in front of the coven. Myrtle warns the girls that they are all toads being slowly boiled by Fiona. She would rather burn at the stake then boil. She is then burned at the stake. Back at the house, Queenie asks Fiona if Myrtle really was a bad person. It turns out Fiona made Queenie use her ability to cause the burn marks on Myrtle’s hand. Myrtle is not the woman in black. Instead of answering the question, Fiona butters up Queenie, even suggesting that Queenie could be the next Supreme. So she definitely has Queenie wrapped around her finger. Spalding still has Madison’s dead body in his room, but it is beginning to stink something fierce. And, when he tried to pull her out of the trunk he stores her in, he pulled her arm right off. Meanwhile, Misty finds the charred body of Myrtle, and brings her back to life.